Paula de Wys-Koolkin (front row, third from left) was one of 17 participants from the European Buddhist Union brought together to discuss Engaged Buddhism. The European Buddhist Union (EBU) is an association that consists of individual Buddhist centers of all traditions, national Buddhist unions and organizations that work throughout Europe, like the FPMT. In the last few years, under the leadership of President Frans Goetghebeur, it has become quite active on several fronts, including establishing representation at the European Commission and making contact with individuals and organizations in other parts of the world. 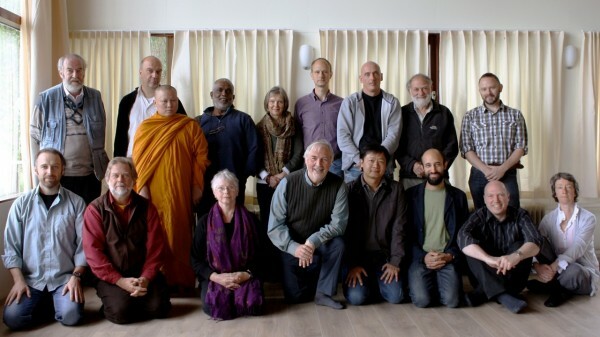 In June 18-19, 2011 the EBU’s Buddhism and Society Commission brought together 17 participants for a two-day brainstorming meeting in the Netherlands on what is usually called (socially) engaged Buddhism. The aims of this conference were to exchange ideas on how Buddhism can contribute to a better world, evaluate the connections between Buddhism and social engagement, promote communication between, and mutual support for, Buddhist initiatives all over the world – and, of course, to network. Taking part in this informal conference were representatives from the USA, Europe and Asia, some of whom are well-known for their work in this field, like Zen teacher Bernie Glassman, or Prof. David Loy, who publishes his work through Wisdom Publications, or Sri Lankan Harsha Navaratne, or Prof. Laszlo Zsolnai. Others are less known but equally as interesting and experienced – it was an amazing group of people! At the end of the meeting we had a discussion about the definition of the term “socially engaged Buddhism,” since some people think that it only means working in the community on projects like hospices, alleviating hunger or homelessness, while others interpret the term more broadly. We all agreed that the most basic definition is “doing that which benefits others.” So, when Bernie Glassman told of the six-day conference he had organized in the U.S., with each day centered around a topic like working in prisons or with the homeless, I asked him what he thought about doing a day on building holy objects like stupas and statues. He answered that if there had been sufficient interest in that topic, he would have scheduled a day for it. My question came about because of the importance that Lama Zopa Rinpoche places on the power of holy objects to help beings, next to the other projects found within the FPMT like hospices, prison work, a leprosy center, liberating animals, feeding monks, an eye hospital, etc., so I was pleased with the openness of his reply. This weekend was meant to be a start of something, not just a one-off event, and hopefully we will be able to organize a European conference on this all-encompassing subject in the next few years. Paula de Wys-Koolkin, a long-time student of FPMT, currently serves on FPMT’s Board of Directors and is director of Maitreya Instituut – Amsterdam.